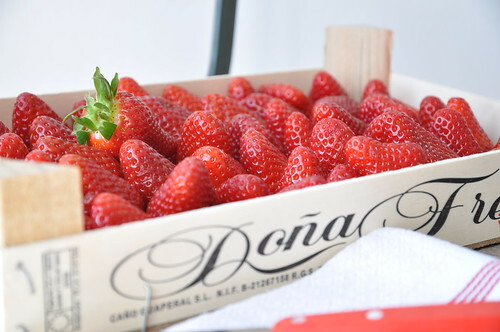 We love strawberries - they taste like spring. The girls have their spring break, now. We don't have any real plans yet, but that might change. Right now, they just enjoy playing together. They really missed each other last week. Little H. is finally her usually self again, too. She felt tired the first couple of days and had some trouble transitioning from days filled with activities and friends, to the normal house setting and routines. I can relate to that, I often feel like this when we come back from a trip or vacation. Luckily the weather has been on our side, so last weekend we spent as much time as possible outside, even had lunch outside, and sat at home with the windows wide open. And we all had strawberries, lots of them! I'm wishing you a great week!